This is another mid-valley sight that’s about to disappear along with what’s left of the Albany Paper Mill. 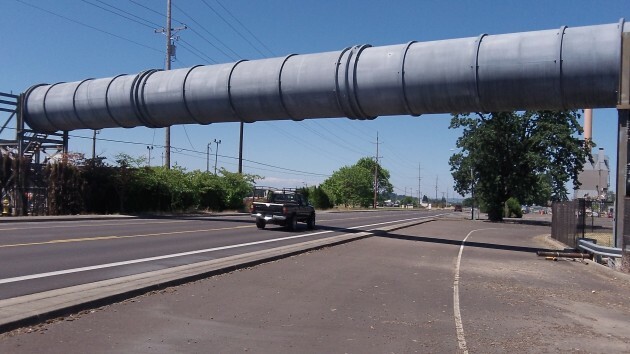 It’s the overhead tunnel on Old Salem Road that used to hold a massive array of piping and other gear connecting a cogeneration plant on the west side with the mill proper on the other side of the road. Frontier Industrial Corp. filed for — and the Linn County Road Department issued — a permit to close Old Salem Road underneath the structure for Wednesday and Thursday, June 24-25, for the purpose of demolition. The permit application was filed by a representative of the demolition contractor whose telephone area covers part of Houston, Texas. The road closure is scheduled from 7 in the morning until 7 at night both days. There was no indication of a designated detour, but Millersburg residents can probably figure out how to get to Albany and back using I-5. 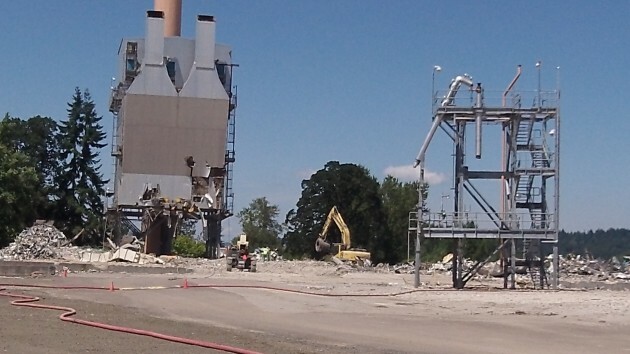 The cogeneration plant had been installed when the mill was owned by Willamette Industries. Only the tunnel itself remained on Monday as the generating machinery was removed earlier. Almost all of the formerly massive mill has also been turned into scrap by now. In May, when I last took a look at the site, a spokesman for Memphis-based International Paper told me demolition would likely be finished in July and the mill site would then be ready to go on the market for sale this summer. This is supposed to be gone by the end of July, a company spokesman said in May. Two days to take down this tunnel? I was employed by the contractor that erected that tunnel (G.L. (Vern) Johnson). We held up traffic for 4 hrs to put it in place. We used two cranes. Two days is ridiculous! They could have hired me for half the price and 1/4 the down time to the road it crosses. SIMPLE JOB! This is so simple that nighttime work was/is totally feasible……even with one crane of sufficient size. Good Gawd! I drove my car under it last Saturday evening…..No sweat! Weld 4 pick points and it’s GONE! This is NOT a heavy pick for a crane, let alone two of them. Piece of Cake! My spouse and I just drove down toward the “tunnel” to have a look and it was down, lying on the east side of Old Salem. The tall pink tower was also lying on its side, and the building next to it was smashed up some more. Took pictures as well as we could. Wednesday 6/24 at 4:00 p.m. Looks like the road is open now; traffic going in both directions. One last thought on the old Albany Paper Mill. While I was employed at the mill with the contractor I worked for, I developed a very good working relationship with one of Willamette’s young primary project engineers…Dan Freeman. Great guy! He knew his “stuff.” He and I were like yin and yang. Smooth. I’ll never forget what he said to me one day. He couldn’t have been 10 years out of college (maybe less) in 1997. He said to me: “This mill is the most efficient kraft mill on the west coast and in 20 years it will be gone.” I asked him why, being so efficient ….? He said simply, “It doesn’t fit the Wall Street model. They want ‘write-offs. That’s why you (me) have a job.” Brilliant guy as as an engineer. He wasn’t far off. Most “management guys” would never have made that prediction. I wonder what Dan is doing these days. He was the smartest guy I ever met with a cerificate on his office wall, bar none. He’s one guy I hope is getting his million $$/year. If so, he deserves it. He was put in a very tough position when I first met him in late 1994. Expendable. He exceeded all expectations from my view and I’ve known many “engineers” that couldn’t carry his jock strap. (can I say that?) He OWNED the Secondary Fiber Project and the Co-Generation project that followed while dealing with a contractor (my boss) that wasn’t very easy to deal with, despite the contractor’s competence. The success of those two projects fell mostly on Dan Freeman, and nobody else. Under his guidance, all we had to do was pour the concrete and erect the steel. We had the easy part. Dan drove those projects and did his job very, very well. There were problems at times…but Dan was the man, and we all knew it. He had the answers, every time. What a shame to see all that effort go down the tube to satisfy some obtuse stockholders. Albany will never be quite the same.